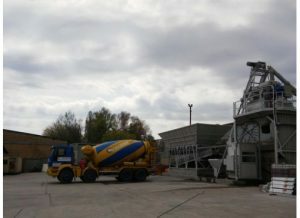 Before installing small concrete mixing plant, what should you pay attention to? (1) Install each part of the cement silo one by one on the ground, lift the cement silo, and turn the side of the lower bin support to the powder batching system, fix the upper and lower bins, and finally fix the anchor bolts. (2) Put the air compressor on the side of the finished product hopper, connect the outlet of the air compressor and the inlet of the air control box with the trachea, and connect the outlet of the air control box to the trachea of ​​the broken arch of the cement warehouse. (3) Installation of pellet batching system On the basis of the lifting and pelleting batching system, connect the plugboard, connect the two sides of the heightened board and the plugboard, and then unfold the original aggregate conveyor. Connect the front and rear racks so that the drum motor is aligned with the center of the hood of the mixer and the anchor bolts are fastened. (4) Installation of the finished product storage hopper The finished product storage hopper shall be lifted, the legs shall be erected, and the walking platform and ladder shall be connected with the finished material storage hopper. (5). Lift the pump in place and connect the output hose. (6) Installation of Screw Conveyor Lift the screw conveyor and connect the ball screw hinge of the screw conveyor to the discharge port of the cement silo, so that the discharge port is aligned with the feed port of the powder hopper, and then the conveyor and the cement silo are connected with the wire rope. Attach the lugs and finally secure the anchor bolts. (8) Installation of finished product belt conveyor The finished product belt conveyor shall be unfolded from the bend, the rear frame shall be placed on the foundation, the front and rear frames shall be connected, and the front and rear legs shall be connected with the conveyor. The support is connected with the lifting lug on the frame, then the front of the conveyor is lifted, the front and rear legs and the diagonal braces are connected, and the anchor bolts of the front and rear legs are finally fastened. 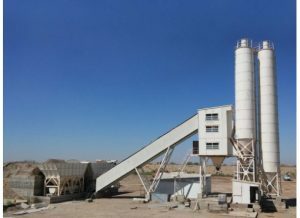 This entry was posted in Solution and tagged batching plant installation, concrete plant installation, installation procedure of batch plant, installation readymix concrete plant cost by camelway. Bookmark the permalink.